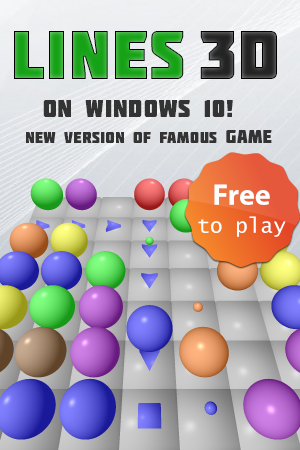 You have no Windows 10 installed, so you cannot download Lines 3D game from Windows Store, but you can play Lines game Light version online! The game is played on a 9×9 or 7×7 field, depending on the mode selected. Each turn three new balls chosen out of seven possible colors are added to the random field squares. The goal is to survive as long as possible, by removing figures of balls of the same color. The specific form of the figure depends on game mode. In order to assemble the figure, the player can move one ball per turn, if there is a path (set of adjacent empty cells) between the current and the destination squares. Player earns points for each complete figure according to the formula (n-nmin+1)‧n, where n is the number of balls in the assembled figure, and nmin — the minimum number of balls in the figure of the current game mode. After the final move, when complete figure disappears, next three balls aren't added (the player gains one turn). Classic mode in which the figure is a vertical, horizontal or diagonal line. The minimum number of balls by default — 5, but it's possible to select 4 or 6 in the settings. Field size is 9×9. Minimum figure is a 2×2 square. It's possible to remove 4 or 6 balls per turn. Game field is 7×7 in size. The figure contains at least 4 balls arranged at the corners of the rotated by 45 degrees square. The maximum number of balls in the figure is 9. Field size — 7×7. The block is a figure of arbitrary shape, made up of adjacent balls. The minimum possible number of balls in the block is defined in the settings (7 by default). 9×9 field.